It’s been a long time since I’ve shared my favorite books I’ve been reading with you . We’ve been diligently going to the library every three weeks since one of my New Year’s personal goals is to not pay any library fines this year. So far, so good. I’m definitely a non-fiction reader – even to relax. I really like books with beautiful photos, my kids call them “Mom’s picture books” but they also need to have some value other than just pretty photos. And there usually isn’t a whole lot of rhyme or reason to the books I get, I just pursue the library and pull out books that look good. Sometimes I read books to review for other bloggers/authors and I always let you know when that is the case. Also, this post contains affiliate links, you can learn more on our disclosure page. If you have some favorites you read this month feel free to leave a list of them in the comments. The Refashion Handbook by Beth Huntington of The Renegade Seamstress is such a great book. About 90% of the clothing we buy is second-hand and I’ve been known to buy something just for the fabric or buy something and do a little embellishing or stitching here and there….but Beth takes this to a whole new level. The instructions in the book are very easy to follow (I read through several of them to double check) and there are great photos to help out the visual learner. Some of the projects are good for a beginner, like the Merino Wool Cardigan and others are a little more involved, like the Wild Life Jacket. All the projects have a before photo so you can see what the item was before it was refashioned. You remember the the polka dot nautical dresses of the early ’90s? Did you know you can make a super cute timeless “Little Black Dress” out of one? You can and Beth shows you how. I’m really excited to try the t-shirt resizing and the demin jacket embellishing. Good Cheap Eats by Jessica Fisher of Life as Mom and Good Cheap Eats is FULL of great looking recipes. Of course, I wish there were photos for every recipe but since there are over 200 recipes in this book, that is asking a little too much ;-). Th idea behind the book is that you can feed your family good (real) food for $10 a meal. I believe that is possible since we spend less than that on our meals, so it was fun to get some new recipe ideas. One of the recipes I really want to try is the Creamy Kale with Sun Dried Tomatoes. As you know, we have plenty of kale around here and I still have some dehydrated cherry tomatoes from last season. Instead of the recipes being grouped together by Breakfast, Lunch and Dinner like most cookbooks, Jessica groups her recipes by menus. So, on one page you’ll see the menu – Cajun Turkey Meatloaf, Brown Rice Pilaf, Creamy Kale with Sun Dried Tomatoes – with the main dish recipe on it. One the next two pages are the recipes for the other two dishes plus each page has a kitchen management or cooking tip. The menus are organized in categories such as Going Meatless, Company Dinners, Make Ahead Meals, Breakfast for Dinner, etc. It’s definitely a cookbook to check out. I’ve been learning about lacto-fermentation for a few months. I am a novice and while I’ve shared a couple of things I’m learning, I have so far to to. I was so happy when I saw Fermented Vegetables by Kristen and Christopher Stockey in our library. I’ve rechecked it twice, I think I’m going to just have to breakdown and buy it. The book has three parts – the fundamentals, the basics and the recipes. Even though I’ve read several books on fermenting in the last few months, I learned a lot from the fundamentals section. The basics section is all about kraut, condiments, pickles and kimchi – there are technique tips for each item and how to get the most flavor from your vegetables. This is the section that discusses salting and brining. Then there are the recipes! The recipes are listed by vegetable in alphabetical order. I love this type of organization. When I have a huge amount of summer squash I can just flip to that section and decide how to ferment them. Most vegetables have a couple of recipes. There are even recipes for foraged food like dandelions. While there are not photos for every recipe, there are plenty to make me happy. As soon as I put Grow Your Own Drugs by James Wong in my library bucket, a woman struck up a conversation with me about homeschooling. After a few minutes, she said,”That’s an interesting title.” Well, yes it is and no it’s not about growing marijuana. In fact, while is an interesting book, there is actually very little information about growing anything. Since I’m a pretty avid gardener, I still liked the book. But the title is a little misleading. There are some recipes I want to try out and there is a good list of the top 100 medicinal plants towards the end of the book. I’m using this list as a starting point for my medicinal plant list. 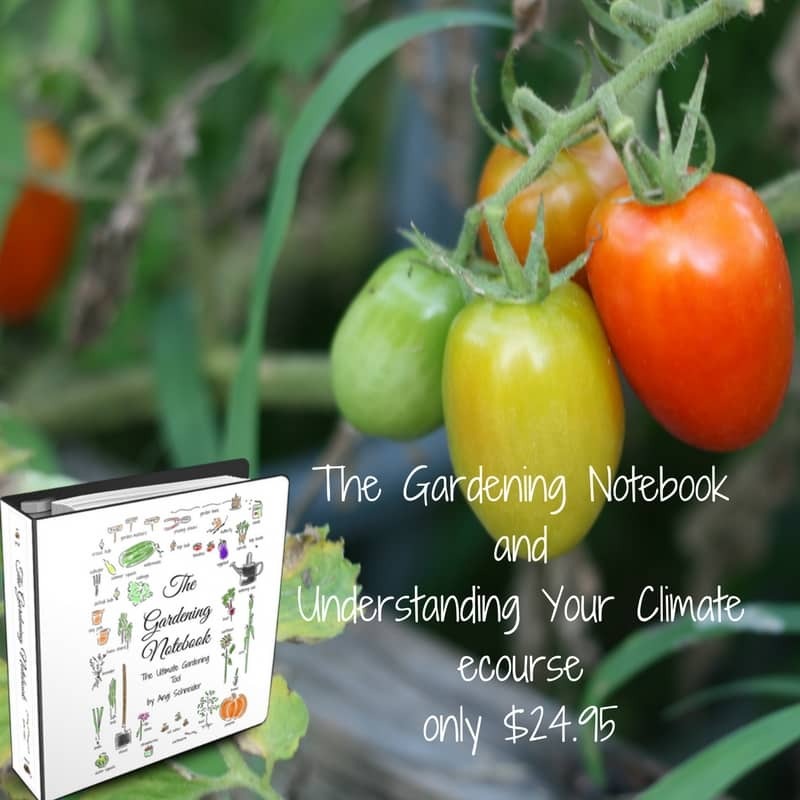 Even if you don’t grow your own herbs, this book is worth checking out for the recipes. You can always order the herbs you need to make what you want. When I found out that Janet Garman from Timber Creek Farm had written a book about chicken care called Chickens from Scratch and was looking for people to review it, I asked if I could be one of those people. I’ve known Janet for almost two years through a homesteading group. She is a wealth of information. Her family owns a feed store and they have quite the farm of chickens, ducks, goat and sheep. And they’ve been doing this a long time – there’s just something about getting advice from someone who has had longevity in an area. One think I love about Chickens from Scratch is that it’s very to the point – which makes it a relatively short book. I read it (word for word) in two evenings before going to bed. I own several books on backyard chicken keeping but sometimes the length makes it hard to find what I’m looking for. I think this will be the book I turn to first to get information, especially if we ever heave to deal with mites or bumble foot. Those things have always kind of scared me and the treatments seem complicated. But after reading Janet’s chapters on them I feel much better about being able to treat our chickens ourselves. Another thing I really like about Chickens from Scratch is that while I’m sure Janet has her own opinion on things like bedding and free ranging (or not) she isn’t judgmental of people who make different choices. She gives information and helps you think out things like how to best protect from predators, is total free ranging best for the chickens, what kind of feed is best and what will we do when the hens stop laying. She knows your smart enough to make your own decisions for your chickens and your situation. The Homestead Kitchen is written by another friend of mine, Heather Hayes Jackson of Green Eggs and Goats – don’t you just love that blog name? While there are some great recipes in this book (I can’t wait to try the Drunken Peach Cobbler) it isn’t a recipe book or cookbook. It’s also not just for homesteaders, anyone who wants a streamlined approach to kitchen management will benefit from this book. After reading it I told Carl, “I don’t have to write a cookbook, now. Heather’s gone and written my book for me.” And that is truly how I feel. Kitchen management and menu planning has gotten so complicated, overwhelming and expensive. I cannot tell you how many times I’ve heard women say things like, “We need to pick up pizza because I forgot to pull out the food we’re supposed to eat tonight before coming to church.” Really? So, if you can’t have whatever you planned, then Little Caesar’s is the plan B? What about making omelets or having hot cereal or fruit and cheese? It’s only one meal, your family won’t starve. I don’t actually say that, but I want to. 😉 I’m not saying we never pick up pizza but when we do it’s because it’s what we’ve chosen to do, not because it’s our only plan B. And that, my friends, is what Heather helps you figure out. With over 120 pages of kitchen goodness there is something for everyone. The first half of the book is helps you rethink your meal planning and your kitchen strategy. There are also some great frugal kitchen tips, a basic pantry checklist and downloadable form for meal planning and pantry organization. Heather also has sample menus with recipes for each season which will help you eat in-season. Then there are recipes for breakfast and dessert. And each recipe has a photo – which I love. This book is available in print from Amazon and in pdf form from Heather’s site. If you buy the print book, there is a super secret link to the resource page where you can download the printables. How would you like to win a print copy of The Homestead Kitchen? Heather has so graciously offered to give one of you your very own PRINT copy of The Homestead Kitchen. To enter just use the form below. Thanks for posting this! I am an avid reader of many miscellaneous topics as well. I’ve been wanting to go to the library but thought I should read the books I own first, although, I am taking my son this week for his research paper so I most likely will not come out empty handed! 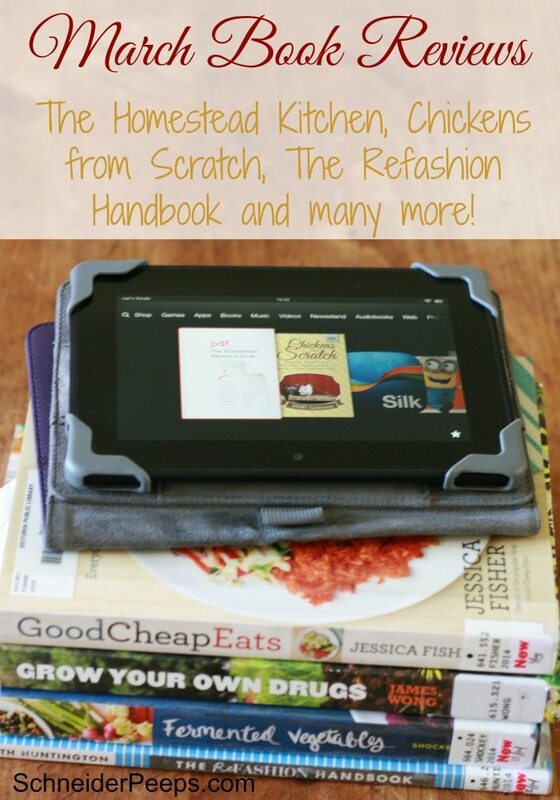 The Homestead Kitchen sounds like the EXACT book I have been looking for!! 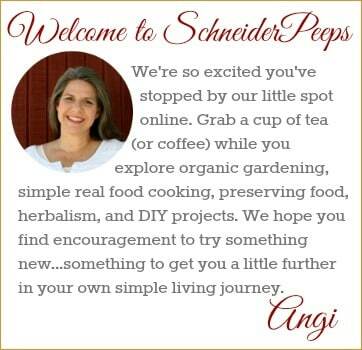 I am moving into my new home this summer and vowed to eat from my own garden but I am a recipe type of girl. I’m not very creative when it comes to making meals. This book will be GREAT in my kitchen!!! Yeah, I bet you won’t be empty handed! How exciting to be moving and have a garden. 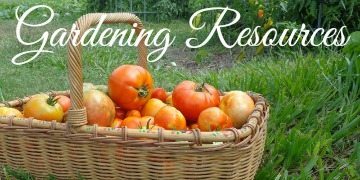 You’ll find that being in the garden will inspire your cooking. I love your contests! If it weren’t for the fact that we live so far from town, I’d probably cave to Plan B quite often. My biggest struggle in the kitchen is remembering to thaw frozen meat out for the menu that I’ve planned for the day. So, quite often, the original menu gets switched around throughout the week. Late dinner is better than no dinner at all! A few years ago I met a family from Kenya and the idea of not cooking dinner because you’re tired or don’t feel like it,is so foreign to them. Their perception really made an impact on me. Thanks for the book suggestions! I’m very interested in the book, “The Homestead Kitchen”. Space! I don’t have enough space to prep my food and have it at hand when cooking starts. Not having space is a hard thing, we find ourselves in that predicament quite often. Homestead Kitchen book sounds like just what I need to get my place organized finally! And with real food recipes too, how can we go wrong? Thanks for sharing these book reviews. I’ll check them all out when I go to our library this week. thank you so much for sharing your wonderful book reviews. One can never have to many cookbooks laying around, just ask my hubby! Thank you so much for having the contest as well. If I don’t win, I think I’ll have to buy it! It sounds like a great book, and I could use some help organizing my cooking. I love seeing posts like this! I’m a bookaholic and love practical books. Especially homesteading and cookbooks. My biggest problem is my library never carries the wonderful books I see. Sigh. My biggest struggle in the kitchen is finding meals my whole family will eat. There are five of us and everyone has different likes and dietary needs. Myself and one of the kids is lactose intolerant so I have to be mindful of what I put into the meals. Another is mildly allergic to rice so I can use rice but not very often. Ahh.. Anyway thank you for the wonderful post. Thanks for the kind words about my book, The Homestead Kitchen. I’m so glad you enjoyed it! Good luck to all who enter! I think I struggle the most with getting into a routine and staying with it. I really like to plan and prepare the meals, but it seems with four different children going in different directions at different times it is hard to stay consistent. I have that same issue, Wendy, especially during the school year. One son takes night classes at the college, one daughter has dance every night, plus we have Boy Scout and AWANA – it can get really crazy. One thing I’ve done to simplify is to have similar meals each night of the week based on who is home to help prepare the meal. For instance, on Mondays only Esther (5 yr old) and I are home so we usually make some kind of venison, potatoes and a green – I have a little bit more time since no one gets home until 8:30, I write on Tuesday nights so we usually have some kind of pasta since all my kids can make pasta just fine, Wednesday is omelets after church, Thursday is chicken that I put in the crock pot when we get home from co-op, Friday is homemade pizza night, Sunday is baked potatoes (in crock pot) and salad for lunch and popcorn and smoothies for dinner. Saturday is the wild card and we usually decide on Saturday morning what we want to cook. In the summer I’m more flexible and try new things but this is how I get through the school year. Getting INTO the kitchen to get started on meals is my biggest failure. I’m easily distracted… wait…what was my point? Oh, yeah. I don’t get pizza when we didn’t remember to cook; It takes an hour to get it to my house and I can cook a pot of lentils in that time–or something less complicated in less than that!